KAMPALA – President Yoweri Museveni has, on his social media page, indicated that Mobile Money users who were taxed 1% of their transaction amounts instead of his proposed 0.5%, will have their money refunded. The President’s statement comes just a day after Prime Minister Ruhakana Rugunda told Parliament that government was returning the Excise Duty amendment Act to Parliament for review. On July 4, the President published on the same platforms his view on the newly introduced taxes on social media and mobile money, asking Ugandans to contribute to the country’s economy through paying social media tax. He, however, called for debate on the mobile money tax, proposing that it be reduced from the 1% passed by Parliament to 0.5%. In his latest communication, the President has acknowledged that he assented to the Bill in err and called for amendment and reimbursement of those already charged. Greetings to you. Thanks for responding to my message of 4th July 2018 on the issue of social- media and mobile money taxes. There were many responses. Some, like Brenda Margaret, saying that the ‘pigs’in Govt are filling their stomachs. Otherwise, people would not mind paying taxes because we all want the country to develop. Others, falsely, claiming that all the ‘massive taxes’ has failed to develop the country. What can 0.5% do? That wrong statement was by Rose. RC@Rhone said that at Sh.200 per day, the tax would bring in Sh.720bn per year yet “all the developments” would still be funded by loans. Tusime Peter wonders what will happen to those who had paid the 1%. George Mugwanja said tax should be simple and easily collected. Henry Othieno wonders why we do not tax the multinationals. Hackim Niwazy, commends my message but informs me that they are taxing mere deposits. 1. Corrupt and unpatriotic pigs in Govt either steal the money or spend it on themselves (ego-centrism). That is certainly true to some extent. However, they steal or misuse the money that is already collected in the form of taxes. They cannot steal or misuse money that is not yet collected. What the broader category of pigs steal or misuse is part of the 14.2% of the tax:GDP ratio that is already collected as Govt revenue. On the issue of expanding the size of the GDP, the NRM has acquitted itself admirably on that front because the average rate of growth of the economy in the last 32 years has been 7% per annum. It is the GDP: tax ratio that has remained low. Since we are developing our country, we need enough money to do so and we must handle all the 3 problems: corruption, selfish use of the money by elements of the elite and the under-collection of taxes compared to the growing size of the GDP. In the previous statement, I gave you the comparative figures. Some countries in Europe go up to 30% of GDP: tax ratio. Our 14.2% is too low even if there was no corruption etc. 2. Ugandans have been massively taxed but where is the development? Come on, friends. Be serious. Only the other day we were at Kololo reminding ourselves that infectious diseases (polio, measles, T.B, small-pox etc), water-borne diseases and vector-borne diseases have greatly declined. Why? It is because of : immunization, more accessing safe water and controlling the vectors (mosquitoes, tse-tse flies, etc). On the contrary, 40% of the deaths are due to non-infectious diseases (the so called non- communicable diseases – heart, kidney, diabetes, cancers, hypertension etc). These are due to eating too much and not doing physical work (collecting firewood, collecting water, cultivating, walk to and from work, etc etc). That is on health. You can go to Education. 2 million children in the Primary Schools in 1986; now 9million. 190,000 students in the Secondary Schools; now 1.8million. 5000 students in the university now 200,000. Electricity – 60mgws in 1986; now 2000 mgws. Telephones- 23,000 in 1986; now 23million. Roads, Roads, Roads: 1000km of potholed tarmac roads; now approaching 6000kms of tarmac plus 1000pieces of brand new Road equipment for the murram roads. Piped water systems up to small Trading centres such as Kasambira in Kamuli; big irrigation schemes like Mubuku and Doho. The brand new ICT backbone that enabled the internet cost to go down from USD1200 in 2013 to USD 300 in 2014 to the current USD 70 per Mbps; then the undersea cable in which UTL has shares. Here, I have been talking about Govt projects. How about private units of wealth? How many new permanent buildings in the Kampala- Entebbe- Mukono- Nansana area? Do you have eyes to see? How about the factories? How about the hotels? How about the cars, the buses, the boda bodas etc? How about the Kgs of tea produced, the bags of coffee produced etc per annum? Tea -3million kgs in 1986; now 60milion kgs. Coffee-2million 60kgs bags; today, 5million 60kgs bags- mainly on account of OWC in the last 3 years. How about the cattle? 3million in1986; now 14 million. How about scientific research in Agriculture, engineering, food science, medicine etc? How many patents do our scientists have? How about the petroleum and gas that was discovered by our Scientists? How about the other minerals? The 200m metric tonnes of iron ore (obutare), the 230million metric tonnes of phosphates, the 300million metric tonnes of Lime for cement, the 3billion metric tonnes of aluminium clays etc. The envy and malice of the enemies cannot diminish the achievements of Uganda and the NRM. Sorry for all the traitors. 3. Since we are collecting more and more taxes, why is everything in the form of development paid for by loans? Not true. The long Olwiyo- Anaka- Koch – Goma – Gulu- Acholibur- Kitgum – Musingo Rd (235.1 kms) has been paid for, 100%, by the Uganda Govt. The Sh.440bn Kampala-Masaka Rd was paid, 100%, by Uganda Govt. Kampala- Mityana; Mbarara- Kikagate – Murongo ferry; Ishaka- Kagaamba; Jinja- Kamuli; Mukono- Kayunga – Njeru; Iganga- Kaliro; Musita-Namayingo- Busia; Kampala- Kafu- Karuma- Gulu; Soroti- Katakwi- Moroto; Moroto- Nakapiripirit-Muyembe; Mubende- Kakumiro – Kibaale – Kagadi- Ndaiga; Matugga- Semuto-Kapeeka; Lira- Kamudini; Mityana- Mubende- Fort-Portal; Mbale- Tirinyi- Nakalama; Tororo-Mbale- Soroti; Mukono-Katosi-Nyenga roads; etc etc have all been paid for or are being paid for, 100%, by the Uganda Govt. No loan., No grant. Even the ones paid for by loans such as Fortportal – Kamwenge partially; Ntungamo- Mirama Hills ; Atiak- Nimule etc; in the end, are funded by the Uganda Govt because we pay back those loans. Each year, we spend US$ 821 million paying back those old loans. This is not of great significance. Many of the expenditures are paid for by the Govt tax revenue of Ug.Sh. 17.5trillion and the Ug. Sh. 15.3trillion borrowing from outside and from inside (8.3trillion from outside and 7 trillion from inside). Who lends to the Govt from within the country? NSSF, Banks etc through buying treasury bills and bonds of the Govt. Treasury bills of the govt and bonds are pledges, in the form of documents, where the govt undertakes to pay back, without failure, with interest, the money lent to the govt when the agreed period expires. The problem of funding govt programmes with loans is that those loans have interest on them. Indeed, each year the govt pays Ug. Shs 2599bn as interest for the old loans not to mention the paying back of the principal, the amount of the original money that was borrowed. This could construct six (6) Masaka- Kampala roads because, remember, earlier on, I told you that we spent Sh. 440bn on that road. This is why it is important to raise enough Gov’t revenue in taxes to stop wasting our money paying interest instead of undertaking more projects. 4. Why was there confusion about 1% and 0.5% and charging mere deposits on mobile money accounts which were not supposed to be taxed? It is because this was a new tax and people were not uniformly understanding what was involved. However, there are also elements who, on account of corruption, have been concealing possible tax sources from the Govt and have been aiding tax evasion. They have been hiding the movement of money in and out of the country, the coming in and going of telephone calls, the misuse of social-media for subversion and malice. All these dishonest people tried to misinform the public inorder to incite them against the efforts by the Govt to achieve financial independence from their foreign masters. Ugandans need to know that there are two types of corruption. Some of the thieves steal our money that we have already collected. Others steal the money we have not collected in the form of concealing tax sources, under-declaring telephone calls, under-declaring rents collected from buildings, under-declaring the value of imports etc, as already pointed out above. Given the size of our economy now, we should be able to attain budget independence and self- sufficiency if we collect all the legitimate taxes. What are legitimate taxes? The strategy of many far- sighted countries is not to tax, or not to tax too much, the production (manufacturing and agriculture); but, instead, to tax consumption, starting with the luxuries- beers, cigarettes, whiskies, fuel, vehicles etc. This is inorder to enable the population to create more wealth ( factories, farms, clinics, engineering services, etc). We, therefore, do not tax machinery being manufactured in Uganda or being imported for the beer factory or the primary raw-materials for the manufacturing for that factory. This is to enable the factory manufacture cheaply so that it can make profits and get encouraged. When the beer is produced, however, the Govt starts by imposing excise duty – the tax collected as the beer is leaving the factory. Later, the Govt will add the consumer tax. Who pays this tax? It is the consumer ( the buyer) who voluntarily buys that bottle of beer inspite of the slightly higher price – factory price plus the two taxes- excise and consumer. The factory does not pay other taxes until it starts making profit i.e. its costs of production being lower than what it earns. This tax is called corporation tax. Sometimes, the govts, in order to encourage the expansion of the factory, may give tax holiday of 10 years and, therefore, this corporation (profit) tax is not collected for those ten years. Why? It is because this factory is very useful. It has created jobs for, maybe, 1000 Ugandans who were previously unemployed. These Ugandans, who are now working, are, moreover, apart from solving their personal problems (education for their children etc) , are already contributing to the tax effort of the country in two ways. Through income tax and through the consumer taxes. Many Ugandans, once they have money, do not take long before going to the bar to buy a bottle of beer on which there is a tax; or buying perfume for his wife on which there is a tax. Govts normally tax consumer items with inelastic demand. Items with inelastic demand are items whose demand does not decline even when the price goes up on account of addiction or because they are no alternatives. Alcohol, tobacco etc fall in this category because of addiction; social-media use is definitely a luxury item. Internet use can be sometimes for educational purposes and research. This should not be taxed. However, using internet to access social media for chatting, recreation, malice, subversion, inciting murder, is definitely a luxury. As I said in my earlier message, it is, moreover, a luxury that is costly to the country’s economy apart from the shillings the users keep spending to use the internet to access the social media (facebook). Thereby, putting pressure on our shillings. In this heammorage, they are joined by the people of games betting where, again, betting machines are owned by the foreigners. This is not only extravagance but also parasitism. Our people are unknowingly being used by foreign interests (telephone companies, social media companies) to parasite on us- to take away our hard earned dollars in order to have fun or promote malice on social media. That is why a social media tax is, really, a minimum. Instead of re-introducing foreign exchange control which other countries still have, we have simply said: “Please since you are endlessly having fun or expressing your views at the expense of the dollars we have earned, make a modest contribution to the building of the country”. Those involved, should, surely, happily, at least, do this minimum. Many people’s earnings are not known. Apart from salary earners and those who use banks, the earnings of many other Ugandans are not known. Mobile money transfers have brought to the surface the big volumes of money that are moving around the country. Each day US$ 52m moves around in the form of mobile money. This is about US$ 19bn a year. Much of this money is by big people; but, of course, some of it is by, economicswise, small people. Therefore, in an effort to have self-sufficiency in budget, this is a convenient source we should not over- look. What small portions can the state take away to balance its budget without hurting the users? That is how the idea of 0.5% for sending and 0.5 %for receiving came up. Due to the newness of the measure, the figure of 1%came up by mistake. I signed the law with the error because we could not delay the other measures. However, Parliament, when it reconvenes, will be requested to correct it. The ones whose deductions had been made on the basis of 1% should have their money re-imbursed. Should we only deduct from the sender or also from the receiver? Is it affordable? We should continue to study those questions. However, the necessity of using this for revenue generation is clear. The only question is: “By how much”? Let us discuss this in a disciplined manner. 6. Some of The contributors put the question: “Where will you put the Sh. 720billion from the social-media tax?” Remember, above, I told you that Masaka- Kampala road cost sh. 440billion. That social-media tax will be equivalent to two roads of the type of the Kampala-Masaka road. There are so many roads that we want to tarmac but limited by money: Mpigi- Kisubi- Nakauka Rd ; Bwizibweera-Nsiika- Nyakabirizi Rd; Iganga-Luuka- Kamuli Rd etc etc. 8.The multinationals are already paying their taxes. 9. Taxing deposits was wrong and it should stop. Re-imbursments will be made. 1.Why spend money travelling to deliver money to friends instead of sending by mobile money which, of course, is commendable? 3. Tax should be simple and easily collectable. Rushing to do the half- yearly de-worming of my cattle ,(your cattle because, in a week, I only eat 400 grammes of beef- the rest is for you , Kampala people). It is glorious that we are not importing beef, milk, bananas, maize, cassava, cement,etc etc. I am contributing, in my small way, to what God commanded us in the Book of Genesis; “To establish dominion over nature”. It says in chapter 1:28 as follows: God blessed them and said to them, “Be fruitful and increase in number; fill the earth and subdue it. 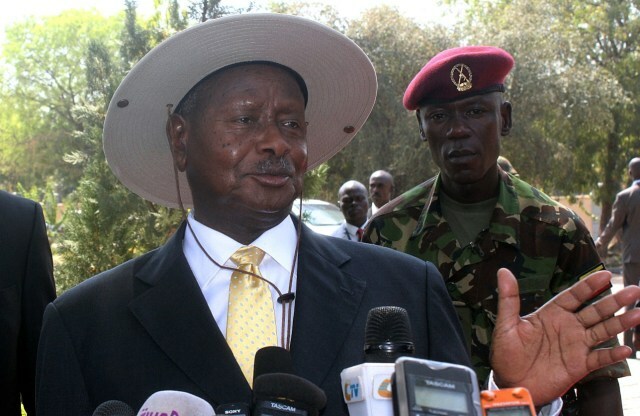 Yoweri Kaguta Museveni Gen (Rtd).